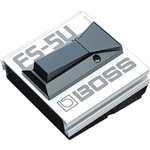 The Boss FS-5L is a sturdy metal latch-type footswitch with an LED to indicate status. Connects to your electronic keyboard using any ordinary guitar cable. From screaming loud to whisper soft, the Boss DS-1 Distortion Pedal can faithfully reproduce the dynamics of your playing style. Level and distortion controls give you complete command of the amount of signal processing. Tone knob lets you tailor EQ right on the unit. The Boss DS-1 Distortion Pedal is a tough stompbox that can take whatever your boot can dish out. The Boss LS-2 Line Selector/Power Supply makes it easy to switch settings among several effects and to route input and output signals. 2 line loops and 6 looping modes provide a wide variety of applications. Used with an AC adapter, the LS-2 can supply 9V DC power to several Boss compact pedals. An ideal supply and switching unit for multiple effects setups.